Egypt's National Alliance Supporting legitimacy (NASL), the group calling for the return of ousted Islamist president Mohamed Morsi, announced it will boycott the upcoming national referendum on the amended 2012 constitution. "Boycott the null and void referendum which will be carried out under a fascist military coup," a spokesman for the alliance announced in a news conference Sunday evening. The group cited "political, legal and procedural" reasons to boycott the poll, scheduled by interim president Adly Mansour for 14 and 15 January 2014. "They have no answers to a scenario in their so-called roadmap based on a no vote in the referendum, which hints to an intent on rigging the poll results." The group also said that the 2013 draft constitution, written by a 50-member committee, was prepared in a way that contradicts the constitutional declaration of 8 July, issued by the interim president himself following Morsi's ouster, which stated that the committee will be simply tasked with amending the now-suspended 2012 constitution. "What we have instead, is a whole new document with a different preamble and a different arrangement of articles," the group charged. The group also said that the "coup rulers" have not announced their commitment to providing guarantees for a free and fair referendum such as independent and international monitoring, adding that holding the referendum on 2 consecutive days without announcing the voting results of the first day gives way for rigging. Over the past week, a number of sub-groups under the Muslim Brotherhood-led NASL announced separately they will be boycotting the poll, including the Brotherhood's Freedom and Justice Party and the Salafist Front. Egypt's first freely elected president, the Brotherhood's Mohamed Morsi, was deposed on 3 July by army chief Abdel-Fatah El-Sisi following mass protests against his troubled one-year rule. The current interim governemnt has since launched a sustain crackdown on Morsi's supporters who continue to hold weekly protests on Friday. The government has said it called on the voters to cast ballots on an amended 2012 charter not a new constitution. It has also said that it would allow international and local NGOs to monitor the referendum which will be held under full judicial supervision. Where is my morning comment ? Whatever the army may do to sanitize themselves, they must know that Morsi is still the President until he has legally left office. You can not amend the constitution when that is the constitution that Morsi was supposed to operate within. Any amendments to the constitution before the Morsi issue is sorted out will assume that the "Morsi Presidency" never existed. What a pathetic infringement of the constitution. 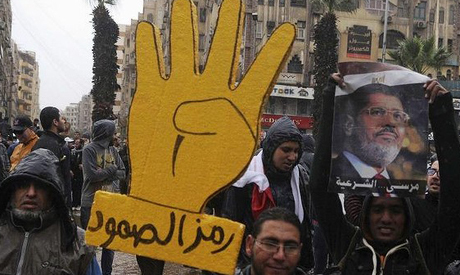 Whether it takes what number of years, the army that removed Morsi will face justice one day. Brotherhood Dictionary... "What Ikhwan say..."
At least we just got an even greater chance for the referendum to be a sweeping success. In the meantime they can live in their "lala land " and keep acting like the paranoid psychopaths they are until they all land in jail or find themselves out of jobs because they wouldn't get their acts together. I look forward to the day this country is ikhwan free. So terrorists and their blind followers want to be left out of the process. Perfect.... Except you guys have been rendered irrelevant ever since your " leadership" has been put in cages where they belong. They r in cages because they fear them. U fear them. U represent the dark side of humanity. U and ur coup. Why is it that ahram always protects u from comments against the hate that u spew. Do u work for the ahram Allen? ?